Harley Davidson is one of the most popular and iconic symbols in the world. 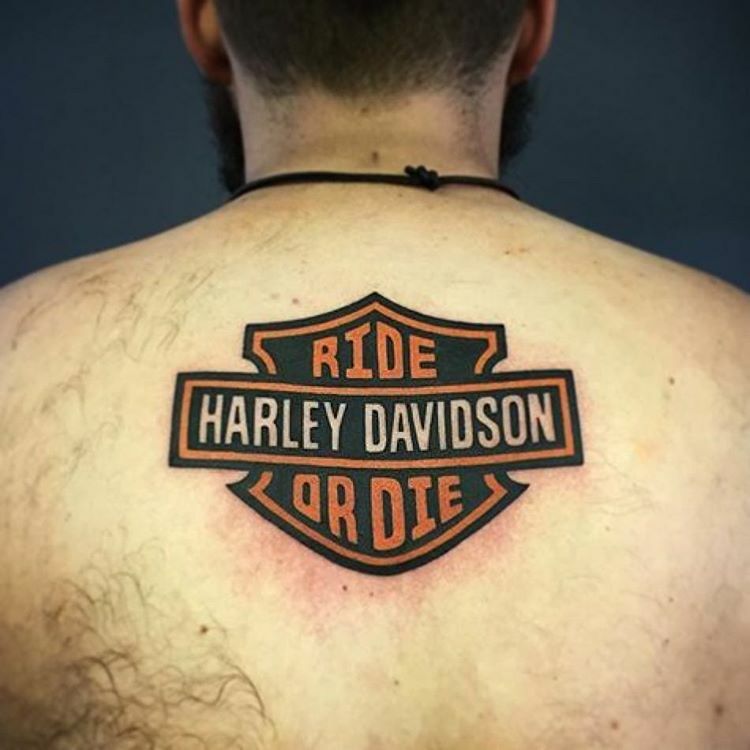 If you have the real passion for wearing a biker tattoo, Harley Davidson is the best option. 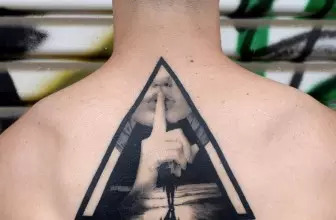 These tattoos can be designed in various different ways. 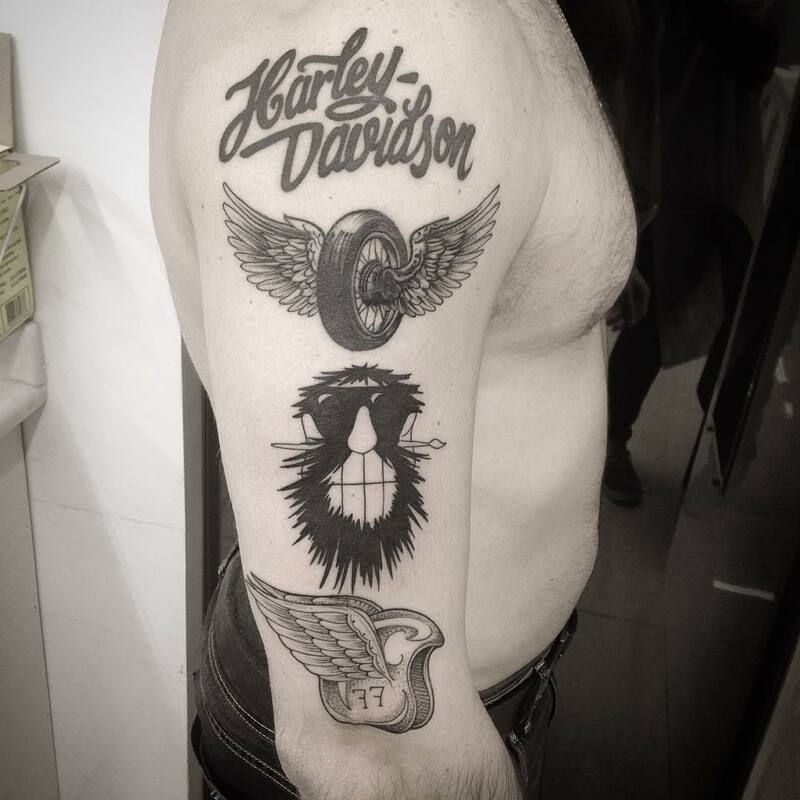 Harley Davidson is not considered as the mainstream tattoo designs. But, lots of men as well as women passionately like to wear this tattoo design proudly. For them, Harley Davidson is the most suitable design and it perfectly represents their belief and their way of life. Besides, these tattoo designs also have some specific meanings as well. 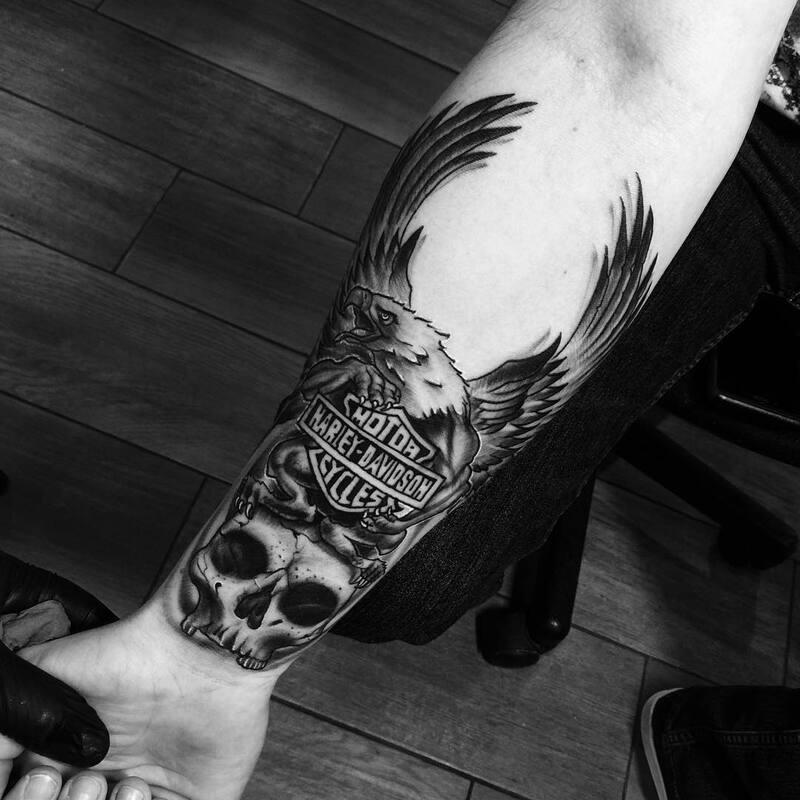 Harley Davidson is considered as the most popular tattoo designs in biker tattoo category. 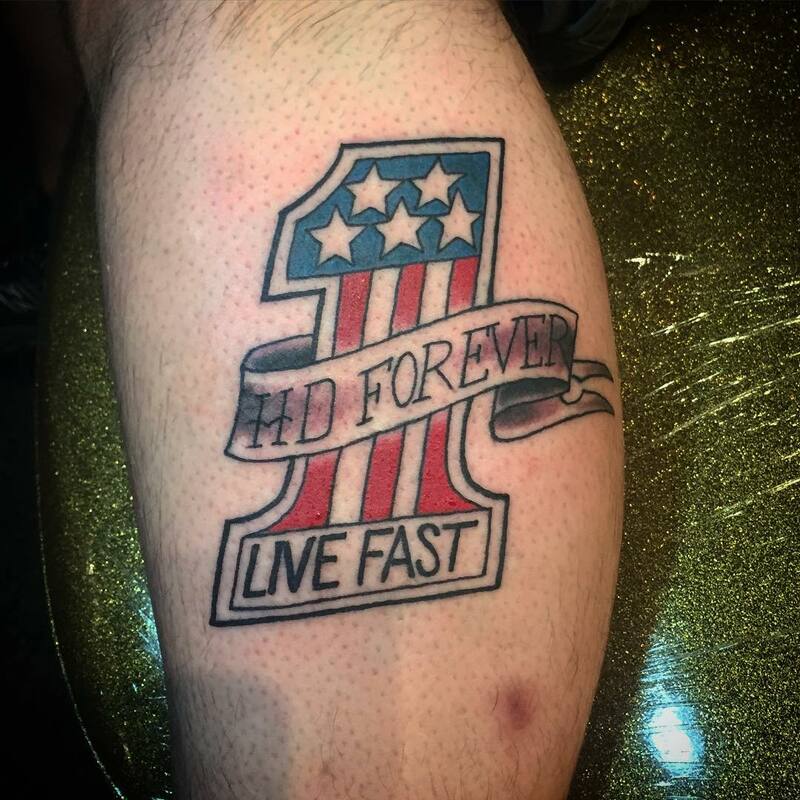 HD is also the most successful motorbike company in the world. People started tattooing their body with motorcycle and biker symbols years back. Harley Davidson is the most popular brand among them. However, some designs contain only Bar and Shield symbol while the designs contain the symbol within Harley Davidson design. Lots of different symbols are used in Harley Davidson Tattoos. Bald eagle is the most common among them. Bald eagle is the symbol of Americans for the past many years. It can represent anything and everything that is associated to America. The bald eagle can be seen on buildings, currency, coins, and statues in America. Harley Davidson and the bald eagle represent America so, both these tattoo symbols are designed together. You can also design motorcycles, wings, engines, skulls, flames and fire within your Harley Davidson tattoo design. Some people use only one symbol with a Harley Davidson design, but some others select a combination of these symbols. 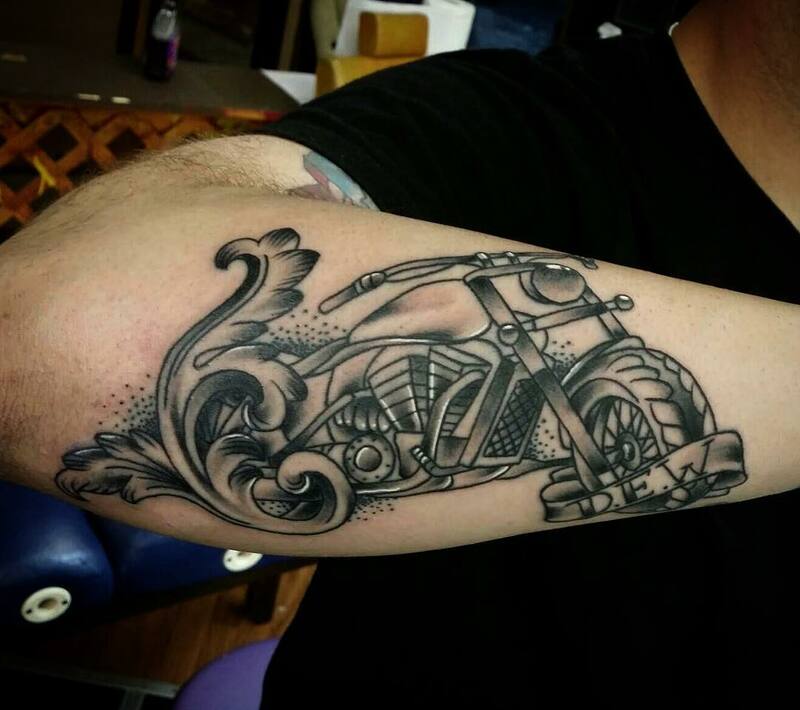 If you have decided to get this tattoo design, you should take time to view the tattoo designs of Harley Davidson. You can also see Harley Davidson tattoo designs with American flag, which can be portrayed in a number of different ways. You can also design these tattoos with both American flag and bald eagle. Sometimes, these are portrayed as if the bald eagle grasps the American flag with his talons. You can introduce this theme in your Harley tattoo design in a number of ways. 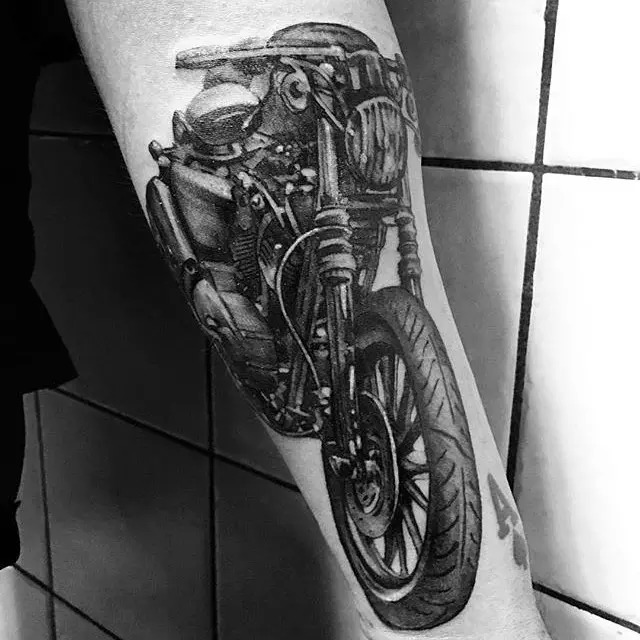 You can design your body with an amazing Harley Davidson bike tattoo in a Vintage style. Harley Davidson can also be designed in bold letters and lines with a Made in USA tag. This is also the most attractive design. Here, Harley Davidson bike is designed with a racing horse. Lots of details are needed for designing this tattoo. If you like, you can also design a Harley bike in neat black color. A Harley Davidson logo on your hand is simply amazing. This is another popular tattoo design. Torn Harley Davidson tattoo is designed with blood droplets. Mostly, men prefer to ink their body with this design. This is also an amazing design if you ink it properly. Harley Davidson is a highly priced bike. Everybody cannot purchase this motorcycle. The owners of Harley Davidson are considered as the king. So, you can ink your Harley with a girl in its back. This design also needs lots of details, so you should approach a highly talented artist to get this design done. This is another HD tattoo design. This is an awesome text tattoo. In this design, the word Davidson is written on your upper back. This is a big tattoo design, so your full upper back area is needed for designing it. You can also design this symbol in smaller size. Your full upper back can be designed with colorful, bold Harley Davidson tattoo design. This design is also amazing. Neat and nice tramp stamp design of Harley Davidson can be inked on your lower back. 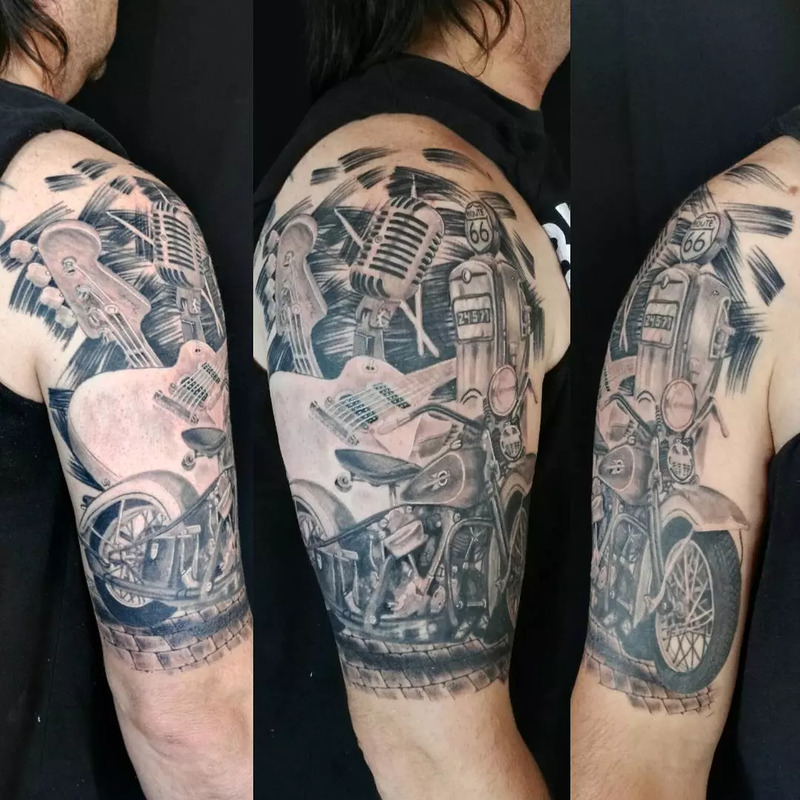 Harley Davidson memorial tattoo, Harley Davidson full back tattoo, HD girl tattoo, Harley Davidson arm tattoo, Harley wings tattoo, Harley Davidson with crown, Harley with skeleton, Harley with engine, Haley with eagle, Harley with tribute, etc are some of the other types of Harley Davidson tattoos. 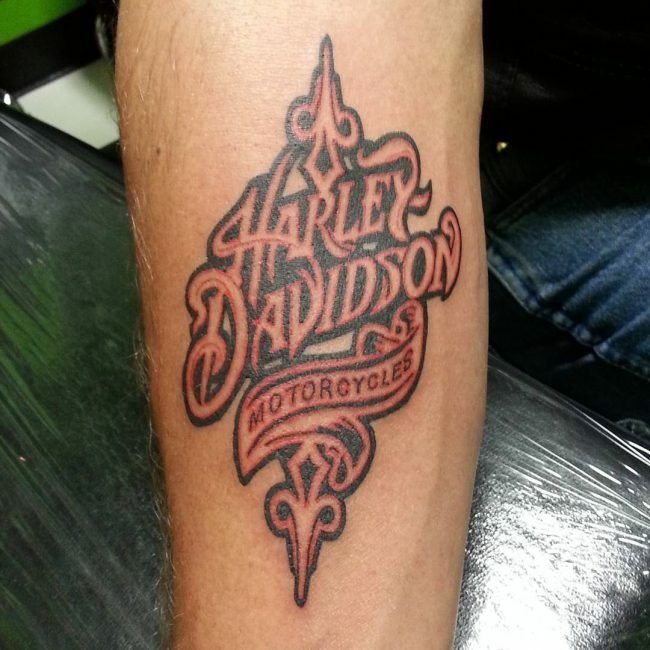 Harley Davidson has a unique color theme, which can be included in your HD tattoo design as well. The colors of HD are white, orange and black. If you want to design your body with traditional HD logo, you can select these colors. 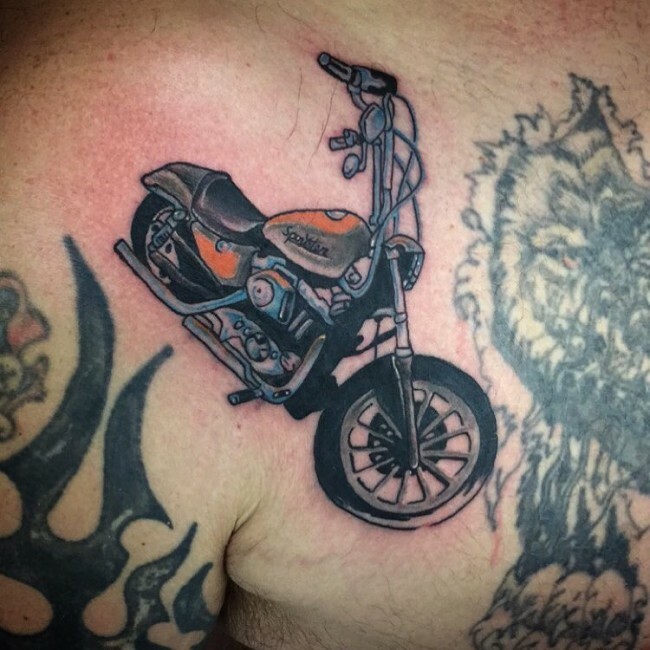 Harley colors can also be included in your tattoo design in a few interesting ways as well. Traditional colors are used for designing the word HD. 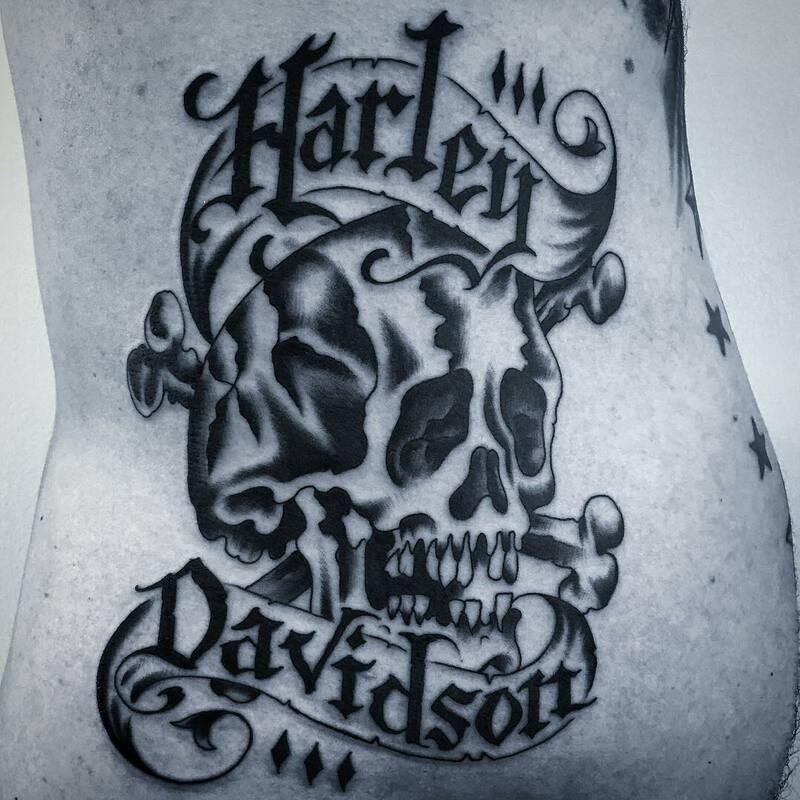 A colorful Harley tattoo can be designed with a skull in the circle. Just like the different varieties of Harley Davidson tattoo designs, you can also place these designs in different locations on your body. Logo of Harley Davidson can be designed as smaller one or bigger one. These types of tattoos can be inked on your legs, arms, back or chest. If you want to get a Harley Davidson design with an eagle, you need a larger area because this design is very big. So, you can ink this design on your chest or back. 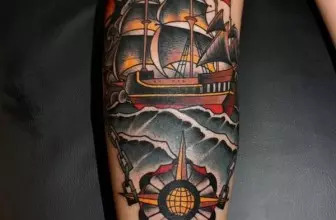 However, there are lots of different HD tattoo designs. You can also connect this design with the nature as well. HD tattoo design with traditional colors can also be considered. These are smaller tattoo designs, so these can be inked in other areas of your body. Really, you can do a lot with your Harley Davidson design. Lots of appropriate symbols are available in Harley category. It can be designed with fire or flames. A great tattoo design can also be made with bright flames and ‘Bar and Shield symbol. Barbed wire, skeletons, or chains can also be added in your HD design. If you like, you can also consider grim reaper or Gothic creature in your Harley Davidson. 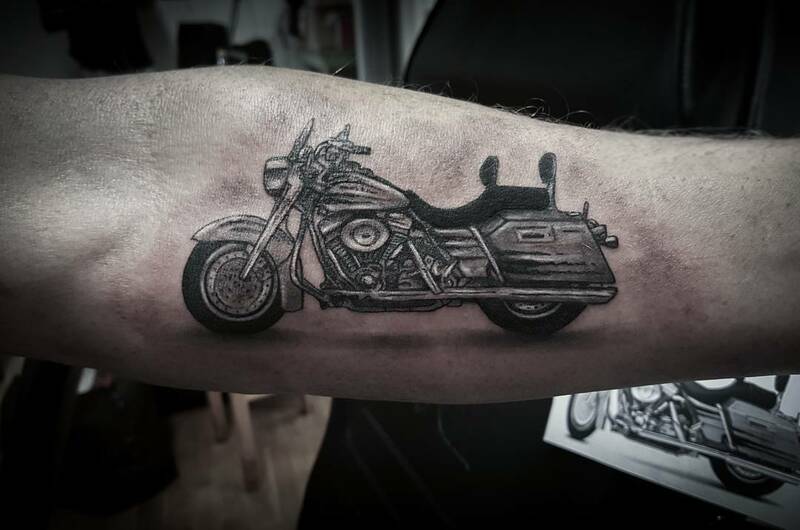 Tattoos of Harley Davidson are very popular, so plenty of unique designs are available for you. In order to get the best one, you can check the online store. You should view as much as designs as you can to get the best idea and inspiration for your Harley Davidson tattoo.